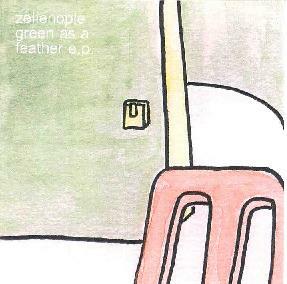 Zelienople - "Green As A Feather e.p." Chicago based Zelienople is hard to pigeonhole by the quartet of songs on this CD. The band is a trio consisting of Matt Christensen on bass, guitar, and vocals, Mike Weis on drums, and Brian Harding on keyboards and clarinet. The promo material indicates that Zelienople has been involved in some interesting projects such as performing for a performance-art piece, and creating tape-loop recordings to accompany an art installation in Scotland. "Rightly So" begins with a slow, subtle, pastoral electronic soundscape and a meditative bass melody. The guitar then takes the lead on the melody, soon joined by drums and vocals. The real treat is the clarinet which for this listener adds a welcome extra that embellishes the band's sound nicely. It all sounds so simplistic yet I was floating along, enjoying the melodic bass, guitar, clarinet and light atmospheric bits. "Green As A Feather" consists of dreamy space atmospherics and guitar soundscapes. The band slowly develop guitar patterns that contrast but work cooperatively with the electronics to create a slowly rolling and evolving landscape. A little Ash Ra Tempel... a little Shoegazer... I was grooving along and would have liked to hear this track developed a bit beyond its 5-minute length. "Wisconsin" features syncopated Tangerine Dreamy synth patterns and soundscapes with just a few additional layers of electronic patterns to add a subtle complexity to the mix. The music builds up to higher volumes than the previous tracks and even starts to approach a small level of intensity. But like "Green As A Feather" it ends far too soon. And "Blueberry Farm" is in some ways a cross between the more song-oriented "Rightly So" and the previous two tracks. There are no vocals but it has the melodic sense that "Rightly So" has. But it's also highly atmospheric yet a bit on the minimalist side. An interesting track. It's difficult to draw conclusions about Zelienople because this 22-minute CDEP really comes across as just a teaser and leaves me wanting more. I'd love to hear these guys stretch out on some longer tracks. The promo material says they play live often. I'd love to hear them. For information you can email Zelienople at mike_weis@iname.com. Contact via snail mail at 5940 North Lakewood; Chicago, IL 60660.